In addition to Kimono rental for tourism, we also provide the rental plan for graduation ceremony! The design of our Kimono can be wore on official occasion as well. Now we have the special plan for Kimono+Hakama! 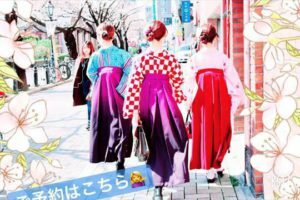 It costs only 4500 en to experience Kimono and Hakama! But this price can only for seven customers each day! Make a reservation as soon as possible!